With an impressive 74-litre capacity, you have plenty of room to roast potatoes, crisp vegetables and cook meats at the same time. It's perfect for cooking together a Sunday roast. The programmable minute minder makes it easy to keep an eye on cooking times, so you can get on with other things whilst dishes cook. 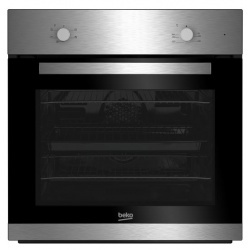 Ideal for homes with young children who have curious hands, this oven features anti-fingerprint coating. This durable coating helps to keep your oven looking clean. 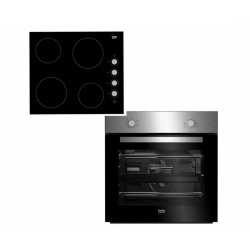 Beko Single Fan Oven with 4 plate electric hob bundle in Stainless Steel finish. Hob Dimensions W x H x D 580mm x 40mm x 510mm. 2 Years Parts and Labour - Warranty Subject to Online Registration. See T&Cs on www.beko.ie/register. You can't go wrong with this simple Fan Oven by Whirlpool. It comes in a gorgeous White Finish and features 3 simple controls - 1 for the Temperature, 1 for the Timer and 1 for the Functions that include a Grill, Oven Light, Defrost and Fan Oven that heats up incredibly quickly so you don't have to wait for ages until the oven pre-heats. This single Oven is 13 amp so you do not need to have a special 6mm cable, you can simply attach a plug (not included) and the AKP436/WH will fit in any standard Single Oven Cavity either at eye-level or under your kitchen counter. Lastly the timer is simple to use and programmable so that the Oven will stop heating when the timer runs out - great if you are popping out and don't want to burn your house down. With a compact design, this Bosch HBN331S4B Electric Oven is an ideal addition for space-conscious households. With an A energy rating, you can be kinder to the environment while saving on your monthly energy bills, as this model consumes less energy. The large 66 litre capacity and four shelf positions allow you to cook more at once. Save time and effort when you're cooking a family feast as you can get dinner on the table sooner. Enjoy beautifully crispy results with hot air grilling. The powerful fan distributes heat quickly and evenly, with no need to turn or rotate your food. This is perfect for pork crackling or a full English breakfast, as your food won't dry out. Using the grill won't leave you with a smoky kitchen - its full width surface helps cook your food more evenly. You can cook bacon and sausages to perfection without turning them and leaving the door open – without any nasty smells or smoke lingering. Your food will be safely and thoroughly defrosted before cooking - the oven starts warming up at temperatures as low as 30°C. Heat from the interior light bulb is utilised for particularly delicate meals such as cakes and desserts, helping to stop them from becoming soggy. You don't need to worry when you're cooking with the kids, as the child safety lock makes it harder to open the oven door while it's being used. This prevents accidents and ensures that cooking will not be interrupted. The PlusSteam function on this oven simply uses a touch of steam to create a richer and glossier colour, a crispier crust and soft delicious texture for all your home-baked bread. This oven actually helps you to get it clean. The cavity has a clever catalytic coating that absorbs and oxidises grease, so cleaning is easier. Thanks to the UltraFanPlus heating system with extra large fan and air guide design, your dish will cook completely evenly wherever you place it in the oven. 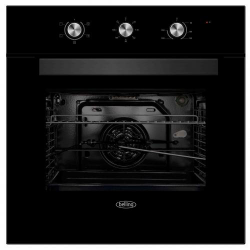 The Electrolux EOA5450BAK, is a stylish black single fan oven. It will perfectly integrate into the modern home. With a capacity of 74 litres there is plenty of space to cook large meals while this oven has achieved an energy efficiency rating of A so you can save money while reducing your carbon footprint. The classic built-in oven: you can cook easily and conveniently. 4 heating modes: offers the right setting for any dish. Energy efficiency A (-20%) is 20% more efficient than A rated models without compromising on results. 3D Hotair Plus: perfect hot air distribution at up to 3 levels. With 3D Hotair Plus, the air circulates absolutely evenly thanks to optimised air outlets. Regardless of whether you bake on one, two or three cooking levels – the result is always perfect. Save energy, A (-30%) is one of the lowest energy ratings of ovens on the market. Great results with less energy.